The Prime Minister, Theresa May, seems to be in a desperate hurry. She wants to break-away from the EU within two years of triggering Article 50, and to have a new EU trade deal in place at the same time. Next, Mrs May has announced, she wants Britain to withdraw from the European Convention on Human Rights, if she’s elected back to power in the 2020 General Election. The Prime Minister is intent on undoing the progressive achievements of her predecessors. Former Tory leader, Margaret Thatcher, urged Britain to remain the European Community in the first referendum of 1975. 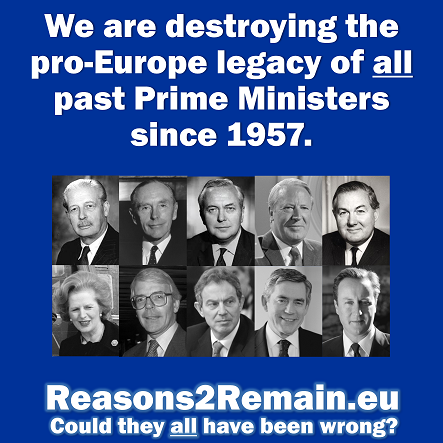 Mrs Thatcher also pushed for, and made possible, the Single Market of Europe. 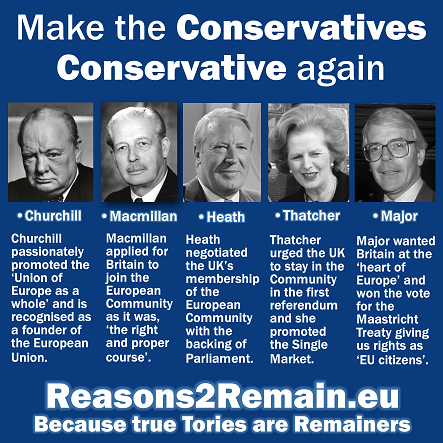 It was one of the Tory party’s greatest leaders, Winston Churchill, who passionately promoted the ‘Union of Europe as a whole’ and is recognised as one of the 11 founders of the European Union. It was Tory Prime Minister, Harold Macmillan who applied for Britain to join the European Community in 1961. It was Tory Prime Minister, Edward Heath, who joined Britain to the European Community in 1973, with the backing of Parliament. 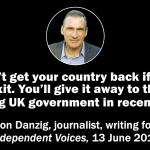 And it was former Tory Prime Minister, John Major, who negotiated and won Parliament’s backing to sign the Maastricht Treaty, that among other benefits gave us EU citizenship rights allowing us to live, work, study or retire across a huge expanse of our continent. 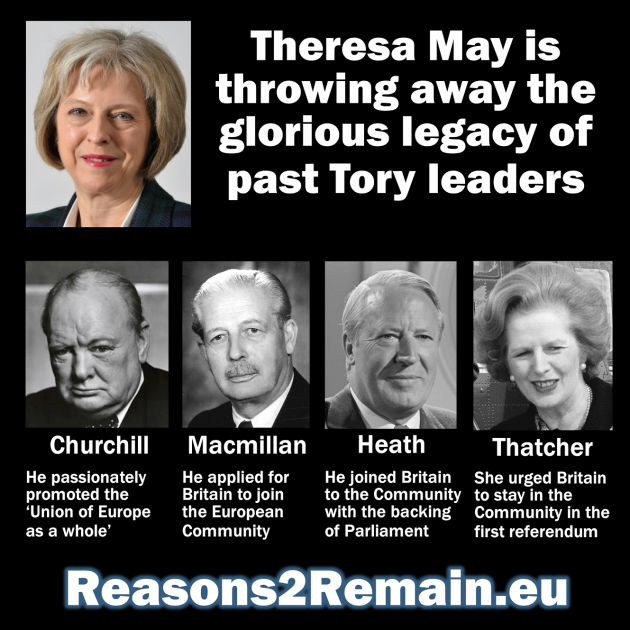 Theresa May is throwing away the glorious legacy of past Tory leaders. Why? Because she is not a true Tory. Her policies are not true Tory goals. 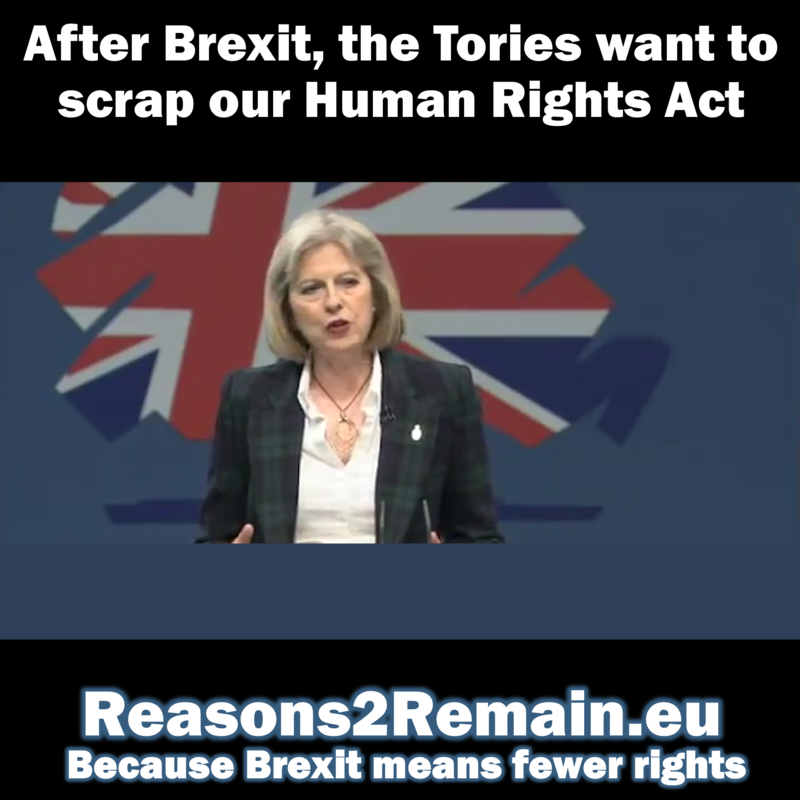 Her vision of Britain outside of the European Community, and of Britain leaving the European Convention on Human Rights, do not represent true Tory values. Mrs May was not even elected as their leader by the Tory Party. 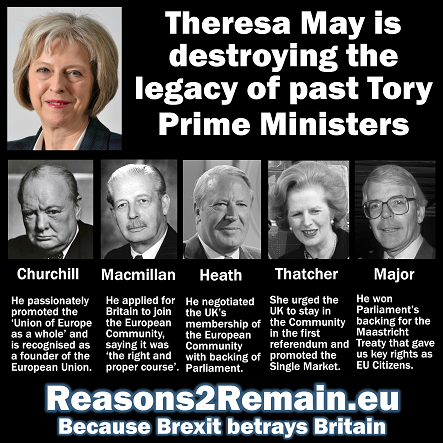 It’s time the Tories seriously considered removing Mrs May from office, to save their party’s heritage, and more importantly, to save Britain. This entry was posted in Current Affairs, Democracy & Citizenship, Economics & Trade, Law & Justice, Politics & Public Policy, The EU and tagged brexit, Edward Heath, Harold Macmillan, Jean-Claude Piris, John Major, Margaret Thatcher, Theresa May, Winston Churchill. Bookmark the permalink.